Before your next big cookout, you need to make sure that your grill or barbecue is up to the task. If you have never had your barbecue professionally cleaned, you need to give us a call. Not only will your food taste better, but the unit will last much longer if properly cared for. We provide the most efficient and affordable barbecue cleaning in Melbourne and we would like to offer our assistance. As you prepare for the outdoor season, consider having your patio area professionally cleaned. 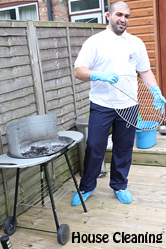 While we clean barbecues, we offer a wide variety of other home cleaning services that you may find useful. You can see all of the services we offer on our services and pricing pages, and we are certain that you will find one or more of them helpful. You can see how useful our clients found our services here, on our testimonial page. If you combine services when you order your bbq clean in Melbourne, consider adding our spring cleaning service or one-off cleaning service. Not only can we clean everything, but you’ll save big, when we do! With our new online service request form, its easier than ever before to schedule cleaning assistance. For faster service however, we suggest calling us direct. You can reach us anytime by calling on 03 8652 1022 and one of our helpful representatives will be happy to send a cleaning crew. Don’t forget to ask about our service combination discounts. Give us a call today!